88-55 T-316L with Dip Tube and Electropolished Stock UN Pressure Vessel - Alloy Products Corp.
***Pricing is for U.S. pricing only. International pricing please contact Customer Service at #800-236-6603. Alloy Products responds to your demand for these versatile vessels with a large inventory of pre-tested, in-stock 5-gallon and 55-gallon models. Many customers prefer using stock sizes to save the cost of testing to UN standards. Closure Options: A choice of several different types of closures adds flexibility to your UN vessel's use. Protective Skirts & Chimes: Added features provide sturdy, stable footing for your UN vessel, and protect it against harsh environments and the rigors of frequent transport. ** Impact-resistant rubber skirts are standard on 9"- and 12"-diameter UN vessels. 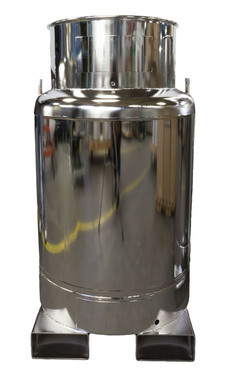 ** Stainless-steel skirts are standard on 18"- and 24"-diameter UN vessels, and optional on 9"- and 12"-diameter vessels. ** Ring chimes make it easier to transport vessels and protect fittings and other components during vessel shipment and use. **Built-in skids simplify the transport of 55-gallon UN vessels.